No more than 30-35 characters per line is recommended, if no engraving is needed type NONE. Your first 40 characters are free, extra engraving charges will be added when your order is processed. If trophy engraving is different for each trophy (player's names, etc.) It may be better to send an email with engraving information, please use the link below. 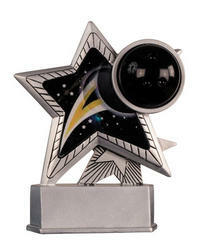 The stunning motion star bowling trophy award is available in two size options. The R7003 resin bowling star is 4 1/2 inches tall and very economical at $6.49. The R7053 is 6 inches tall and will cost $7.99, both include 40 characters of free engraving. A special printing process is used to produce the cool motion graphics. This is a great bowling trophy to award in bowling leagues of all ages. Additional engraving is 7 cents per character. Our helpful and friendly staff will gladly answer your questions, you may call 1-800-787-8777 or use the email link at the bottom of this page.